Minimum order amount of 20 at this time. Hydrofarm's tan Dirt Pots offer value and versatility for outdoor use or as part of hydroponic growing systems. Featuring porous breathable fabric that is made from 100% recycled water bottles, these planters allow your plants to thrive by promoting exceptional root health and vigorous plant growth. The soft-sided construction allows the planter to conform to your terrain, making it the perfect choice for all growing areas. 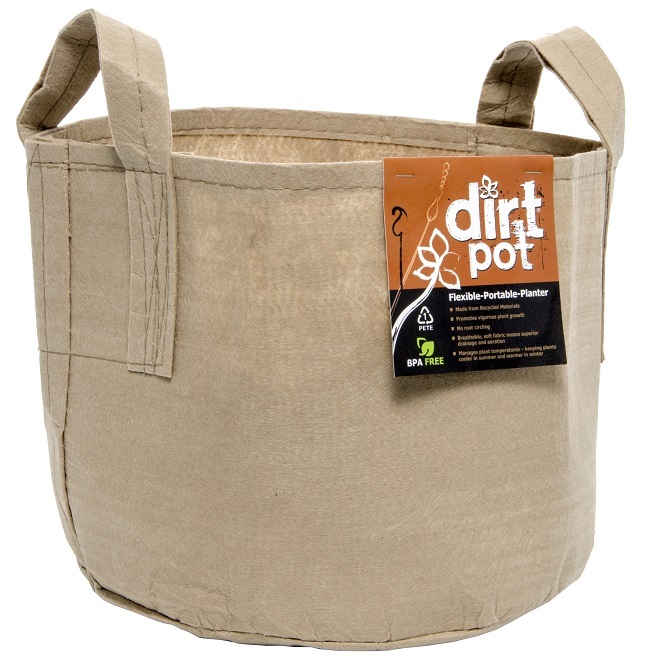 Tan Dirt Pots are stronger than similar products, with reinforced seams and stitching. They are non-degradable, so they will hold up for multiple growing seasons. Washable and durable – can be used season after season.